In this article we will briefly look at facts and statistics about payment methods in Europe. The aim is to provide a starting point for research into whether a particular payment method is actually used by consumers of different European countries, instead of aiming to show the payment method of Europe. Included in this article are: credit and debit cards, contactless payments and online payment methods. Last update: March 8th, 2019. Length: 695 words (4 minutes). Every European country has its own way of paying money. Visa, Mastercard and PayPal are popular payment methods in many parts of the world, but Europe stands out because of its diversity when it comes to the use of online and offline payments. This can be seen, for example, when you look at the use of cash money in Europe. 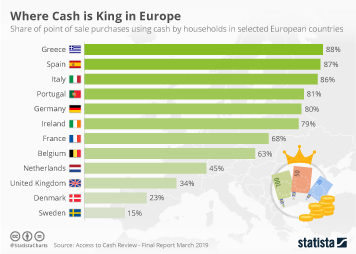 According to numbers from the European Central Bank (ECB), consumers from Malta, Cyprus, Greece or Spain were more likely to pay with cash in a shop or restaurant than their Estonian, Finnish or Belgian counterparts. A second example which highlights the difference in payment behavior presents itself when looking at the total number of debit card payments in Europe. Whilst the highest use of debit cards was recorded in the United Kingdom, with over 17 billion transactions, Germany recorded 3.3 billion transactions, which was less than Poland and the Netherlands. In Western Europe, it's common to pay with credit or debit cards for either offline physical purchases in bricks-and-mortar-stores or for online purchases. Indeed, between 2003 and 2017, the total value of card transactions as a share of GDP increased from approximately 17.5 percent in 2013 to approximately 19.9 percent in 2017. In 2017, Visa credit cards reached a market share in terms of purchase volume of approximately 62 percent of the total European market. But there are many differences among the European countries. Visa reached a market share of 54 percent in Turkey in 2017, whilst Mastercard was the biggest provider in Sweden at that time. The highest percentage of credit card debtors in Europe live in either the United Kingdom or Romania, whereas few Dutch and Germans have credit card debts. Debit cards were most used by adults from Belgium, the Netherlands, Norway, Finland, Sweden and Denmark. A relatively new way to pay is with the so-called NFC or near field communication technology, which allows for contactless payments via a bank card or smartphone app. According to research from MasterCard in 2018, countries from Northern and Eastern Europe used this technology the most. In Poland, 83 percent of all POS transactions were contactless whilst this number reached 57 percent in Spain, 46 percent in the United Kingdom, 25 percent in France and 14 percent in Germany. Contactless was not popular in Belgium or Portugal, with recorded values of four and three percent respectively. There are multiple reasons for these differences. First, countries like the United Kingdom and the Netherlands started to promote contactless payments early on which eventually took away potential reservations. In Germany, for example, respondents to a 2018 survey still worried about fraud from contactless payments. Second, not every country in Europe has access to Android Pay or Apple Pay. Apple’s NFC service is available in, for example, Sweden, Norway, Finland and Italy, but not in Portugal, the Netherlands or Greece. When it comes to the absolute number of cashless payments, nearly 30 billion cashless payment transactions were reported in the UK in 2017, making it Europe’s leading country in terms of cashless payment transactions. One might assume that with a digital wallet, Visa/Mastercard or a debit card from a local bank all payment methods Europe are covered. This is not the case. PayPal is a popular method for consumers in Germany to pay their online purchases with. In Sweden, on the other hand, PayPal was not that popular. Instead, Swedes preferred invoices. In addition to this, some European countries also have their own domestic methods when it comes to online payments. In the Netherlands, for example, most online purchases were paid for using iDEAL, a domestic bank transfer system that is supported by all Dutch banks. In Belgiun, Bancontact (a domestic payment scheme) was almost more used than credit cards for online payments in 2018. 437358. In Italy, approximately 37 percent of respondents reported that PayPal was their most used payment method on e-commerce websites for both tangible and intangible goods. And while direct debit payments were indeed popular in Poland, approximately 15 percent of the respondents preferred to pay for their online products with cash on delivery.